New Block of the Month and More! The days are getting longer, the mornings and evenings are cooler. A few days of rain and soon we will be enjoying the colors of autumn: rich golds, bright yellows, shades of orange and red, a hint of purple and a touch of chocolate. Beautiful! We have those colors! Solids, textures, marbles and more! It's a great time to start collecting for your stash or maybe a special project. Texture Illusions may be just what you are looking for. The colors are more muted because the fabric goes through a different process than most printed fabrics. The dyes are discharged after application. We have a free pattern available for this line and it really shows off the colors. Take a look at the pic below. We saw the quilt in person and it is beautiful even though the colors are somewhat muted. 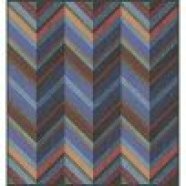 It measures 60X70" and is made with strips of many colors. And we have them all. That herringbone pattern reminds me of the "fletching" on an arrow. Would someone you know appreciate that? We are lucky enough to have the original quilt on loan for your viewing in December! We are very excited to be offering this contemporary quilt for you. "Shattered" will be available as a Block of the Month November 1st or you can purchase the kit if you can't wait! Some of you have seen the top in the shop when Mary was working on it. It is back from the quilter now and hangs in the front of the shop. You can order the kit online or purchase in the shop. If you wish to purchase it as a Block of the Month you can enroll by purchasing the Pattern Pack online or in the shop. Cost is $12.99 which includes the pattern and Thangles to complete the project. Monthly cost is $10.00 a month for five months. Each month you will receive the background and color strips for one color column. You may purchase the border and binding kit at any point for $15.98. 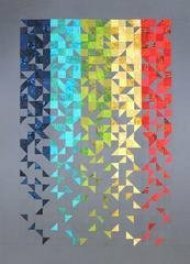 "Shattered" is a quilt that is suitable for even a beginner quilter and the BOM program makes it very affordable. We will have one session to introduce you to the concept and theory of Thangles. That session is not mandatory. The monthly kits will be available on the first day of each month beginning November.